My patients frequently ask me why I do the food/toy drive. Well, I thought I would take the opportunity today to explain myself, for really…it’s a personal why. Approximately 15 years ago, I did the very first Food/Toy drive. It was something that was needed in our community and it was something I could do in offering my support, so I jumped in with both feet. Helping others was something very near and dear to me and of extreme importance. I was raised to recognize the need in others and be grateful for what we have. 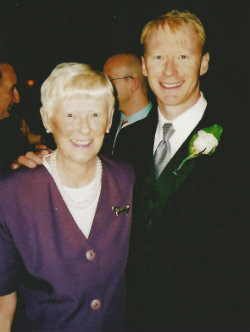 So my “why” comes a little bit closer to my heart, for I also do it for my mother, Beverley. My mother was always helping with various groups and shelters in Scarborough while I was growing up. She was always volunteering and offering support to anyone who needed her, whether it was through our church or the numerous charities that she belonged to. As I got older, we would often help as a family. We would serve Christmas dinner in shelters, hand out presents/clothes to underprivileged youths or just be a friendly smile or ear to those who needed it. Unfortunately though, my mother’s life was suddenly cut short. After being stricken with a rapid form of cancer, she passed away at the age of 64. Heaven had now gained another angel. My mother had touched so many lives that at her funeral, strangers who had found her picture in the newspaper Obituary section came to pay their respects. These were strangers who didn’t even know her name, but recognized her face and wanted to say thank you. Some had travelled from one side of Toronto to the other, taking public transit the entire way, just to say good bye. How proud I was to be her son! To see the lives that she had touched and the difference that she had made! It was these very conversations and facial expressions that forever changed me and led me to doing something where I too could help, for it was time. I was now on my way to complete my first mission trip. It was on this trip that I was able to help hundreds of people that would leave an everlasting impression on me. I was in the most poverty stricken areas of the Dominican Republic, close to Haiti in the sugar cane Ghettos. Truly an experience that I will never forget, for it was an emotional one for sure. After each day, when we were back in the safety of our hotel room, exhausted, the group would remain silent as we reflected on the day’s events and what we saw. There were mornings when the emotions ran wild and all I could hear was my mother’s voice telling me to be strong, smile and help others. So that is what I did, envisioning my mother’s smile as I treated those who were terminally ill or children with hardly any clothes on their backs. So for me, helping in a food/toy drive is easy. It not only allows me to assist in supporting our amazing community, but it also gives me the opportunity to honour my incredible mother. We accept food and gifts in exchange for care, kind of my version of pay it forward. It ends up being such a humbling/rewarding day, for we all feel like we are giving back. This year my children will also be joining us, for we want this to be the biggest toy/food drive ever. Our community needs us, so please visit us on December 7th and let’s all give back!